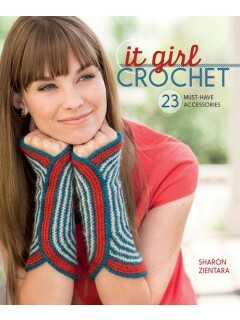 Don’t you love the unique wrist warmers on the cover of this new book? I love the symmetry as well as the swirl effect the designer has created. This is just one of 23 patterns for accessories in this book. They range from scarves, mittens, and caps to more fashion forward looks like a chunky belt and these impressive knee socks. I’m in love with these socks!! If you’re a shawl fan, you’ll find several lovely projects in this book. They are lacy and delicate and include some surprising elements. There are several purses, displaying an array of techniques. Back to those mittens, caps, and scarves. You’ll find a variety in this book that will please everyone on your gift list. I’m especially fond of the Op Art Reversible Scarf, with it’s bold geometrics on one side and lattice look on the reverse. The caps, scarves, and mittens can easily be mixed and matched to create even more beautiful sets. These patterns are fresh and youthful – but not cutesy and just for youngsters. Yarn and color selections can easily move a pattern from sophisticated to casual, from flashy to serene. The yarns chosen for each design are typically available at your LYS or from an online vendor of finer yarns, but substitutions with mass marketed yarns are easy to make as each pattern contains the often rarely found yarn size (#2, fine, for instance). I wish all patterns contained this useful bit of information. This book also contains really detailed charts, some with color added, making them easier to follow in a complex pattern. If you enjoy crocheting fashion projects, this book is for you. It would make a great gift for a fashionista or anyone interested in adding fashion forward accessories to her wardrobe.